Solar PV Monitoring – allows you to easily see how much Solar PV you are using and how much is going back to the grid. A great tool to see if battery storage could be beneficial. 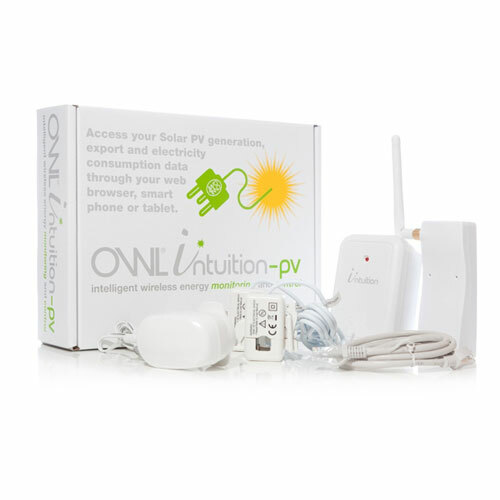 Allows monitoring of the PV generation, export and overall consumption of a property with solar panels. Intuition online dashboard gives you access wherever you go, as long as you have internet access. Android and i-Phone apps can give you access on-the-go. Shows live readings to 12 second intervals, and a historical account of the above; also telling you when you’ve improved your usage habits or your solar panels are performing better. User configurable tariff settings allow the unit to calculate what you’ve spent over the course of a day, week, and month. FITS settings allow you to see the tangible impact your solar panels are having on your bills. Provides graphs showing both historical and peak values, allowing you to identify when your solar panels have been generating the most energy – and therefore the best times to use power in a day.